The Pet Life Active 'Chewitt Wagassy' Heathered Triple-Toned Long Sleeve Performance T-shirt features specially engineered Stretchy fabric that are Lightweight and Permeable resulting in a well Ventilated system that is specially developed to maximize Mobility and Breathability. Features 4-Way Stretch Technology that moves better in every direction with a customized relaxed fit without the squeeze and won't bunch up. The side of the body and arms feature a lighter blend of fabric for strategic ventilation. Features Quick-Drying properties that dries extremely fast while offering Anti-Odor technology that prevents odor causing microbes. The Chewitt-Wagassy Long Sleeve T-shirt is also UV Protectant against the suns harmful rays and fitted perfectly to help assist in containment or collection of shedded hairs. 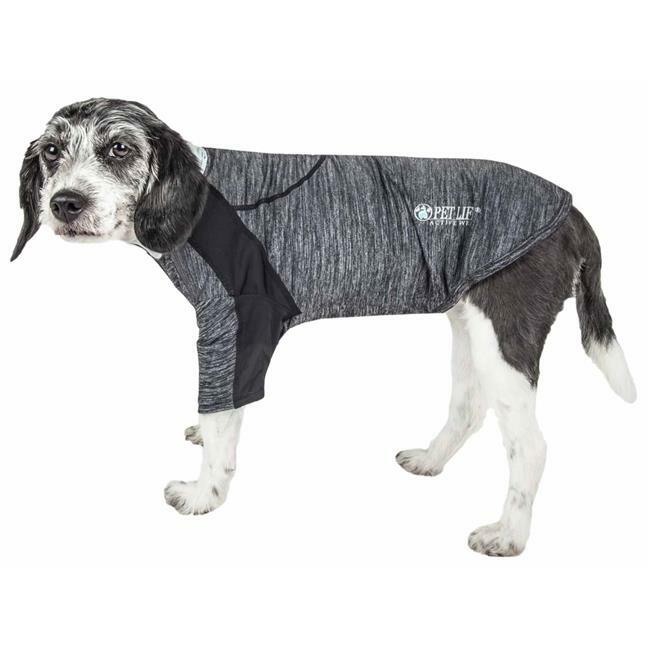 Design features Dual Reinforced stitching at every seam for durability with a convenient zippered design with protective zipper flaps preventing the pet's hairs from getting caught within the zipper tracks. Additionally this T features Reflective Taping for added night visibility and a Leash Slit along the back. Macine Washable. This style is part of our Pet Life Activewear Collection.